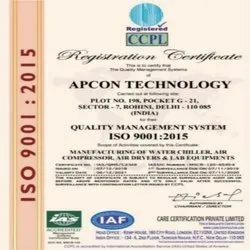 Apcon Technology, established in the year 2008, is engaged in manufacturing and exporting of wide range of Automobile & Laboratory Product. Our products range are Water Chillers, Air Dryers, Air Compressors, Distillation Units, Ultrasonic Cleaners, Hot Water Circulators and more. Our products have the tendency to give magnificent performance and accomplish the need of the customers. Our products are widely accepted all across the nation and known for nature, dependability and long-term durability. We possess an advanced manufacturing unit that is equipped with the required machinery and facilities to produce caliber products. Our dexterous and skillful team of professionals who are immensely experienced in this industry helps our company tremendously to reach the organizational goals. All our products are made using the superior quality raw material for a longer durability. We have developed an refined warehousing unit at our end that allows us to storage the consignments with perfection. Our company believes that offering quality products is the best way to gain complete customer satisfaction. Established by our mentor, Mr. Amitabh Rathore, we have been able to cater to a huge clientele. Accordingly all our products meet international standards in quality and we tend to offer them within a stipulated time frame to meet the market demand. Our ethical business policies and transparency in dealings have helped our company to gain huge database of clientele all across. Our company has a capacious and sophisticated manufacturing unit located in Delhi, India that has latest technology machinery and advanced tools that helps us in manufacturing flawless range of products. This unit and machinery is efficiently operated by our team of professionals who are immensely experienced in this industry and have the capability to run the production process smoothly and safely. Our company is able to achieve formidable success in this industry due to the enormous and skilled efforts by our employees. Our team of professionals are highly experienced in this industry and hold expertise in the respective domain. The team we have includes Engineers, Technicians, Quality controllers and Research & development personnel. The close coordination of our employees with the employees helps us to understand the necessity of the customers that facilitates us in manufacturing and supplying the products accordingly. We conduct regular training sessions to our employees to keep them updated with the latest technology advancements and market situation. Our company has become a pioneer in this industry and the most wanted among the customers for all Products. Our manufacturing brand is Apcon.